Were those gunshots? Or fireworks? Is that sewage? Or some other substance? 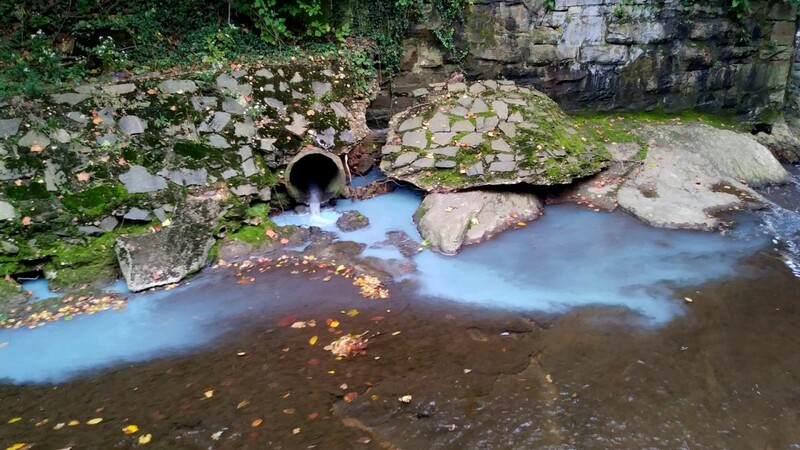 The everyday mysteries of Baltimore endure, this time in the north central part of the city, where a startlingly bright blue discharge was pouring out of a pipe into Stony Run yesterday afternoon. The water in this spot, just upstream from the University Parkway bridge, featured a large lingering cloud of the unknown substance. Downstream, Stony Run flows into the Jones Falls, which empties out into the Inner Harbor and Chesapeake Bay. The Department of Public Works had no information on the discharge this morning. “I’ve asked our Investigations section to take a look,” DPW spokesman Jeffrey Raymond told The Brew via email. A quick check of the spot at midday today (Tuesday) showed there remained a whitish film in the water and a mound of foamy bubbles at the mouth of the pipe. It smelled like sewage. But, then, it always smells sewage-y in that spot. This location, accessed from Linkwood Road, is in one of the areas in Baltimore with a long history of sewage overflows. “The Filthy Five,” watchdog/wags dubbed them years ago. The pipe dumping effluent into Stony Run yesterday is the same one where a sewage discharge was reported to The Brew in 2013 – by a man who noticed the effluent while walking his dog along the stream-side path. That 2013 overflow came at a time when crews were working nearby to replace a separate, 440-foot segment of broken pipe that runs along 39th Street.